The Brazilian Congress, now dominated by the right, may soon vote to lower the age of criminal responsibility from 18 to 16. It would a huge step backward, says Jo Griffin, who is writing a book on former street children in Brazil. A quarter of a century after Brazil introduced one of the most progressive and admired pieces of legislation on children’s rights in the world, its Chamber of Deputies looks likely to vote in favour of an amendment that would lower the age of criminal responsibility from 18 to 16 years. The Chamber is responding in knee-jerk fashion to a public clamour for action on spiralling crime, with opinion polls showing that between 80-90 per cent of the population are in favour of the amendment. But it would be a huge step backwards for Brazil: it would infringe international conventions on human rights, which Brazil has signed; and it would start the country on an alarming course of punitive action. A conservative political climate, a weakened President Dilma Rousseff and a rabid right-wing media all help to account for how the bill to amend the Statute on the Rights of the Child and Adolescent (ECA) is now definitely on the cards. In March it was passed by a Commission on the Constitution. Now it needs to be approved twice by the Chamber, with a three-fifths majority. If this happens, it will then face a vote in the Senate. If it passes these hurdles, which seems probable, the bill will become law. President Dilma will be unable to veto it, as Brazil’s constitution does not permit presidential vetoes in the case of constitutional amendments. The right-wing would be triumphant and it would be another blow for the Dilma government. However, what is far more worrying would be the repercussions this amendment would have on real lives – in this case, those of children from poor communities. Introduced in 1990 to update Brazilian legislation to comply with the UN Convention on the Rights of The Child into, the ECA currently provides for offenders between 12 and 18 to be held in juvenile detention centres for up to three years where they are offered socio-educational activities and rehabilitation. 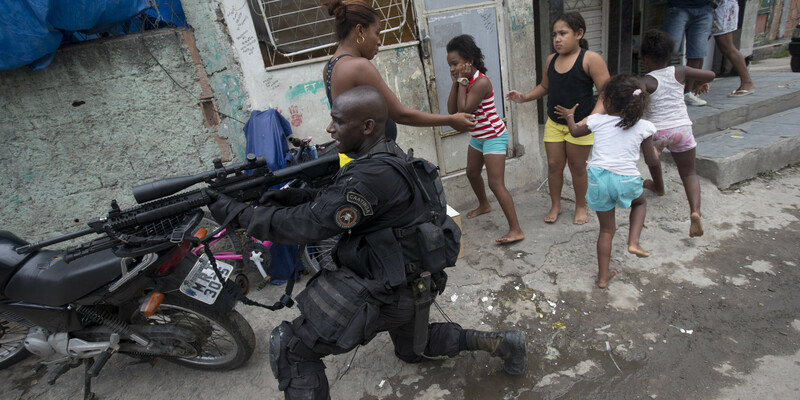 Riding on a tidal wave of public concern about violent crime and a decline in security nationwide – Brazil now has 19 cities in the 50 ranked most violent in the world – the bill purports to deter youths from crime by ending impunity and sending them straight into adult jails. This issue goes right to the core of Brazilian anxiety about the perceived threat from youth from poor communities. And it exposes the criminal state negligence that is really behind the rising crime statistics. — they claim that the bill would lead to greater security, but sending youth offenders to overcrowded and violent adult jails, where they would receive no educational or rehabilitative support, would do no such thing. On the contrary, it would condemn them to sexual violence and torture from gangs, thus likely to turn them into hardened criminals. Conversely, investing in rehabilitation programmes at juvenile centres would make youths less likely to commit a crime in future. Opponents of the bill point to extensive research from the body in charge of youth offenders (SINASE) that details the inadequate conditions in juvenile detention centres. Improving these in line with ECA requirements is the obvious first step to reduce crime, they say. Indeed, many argue that the failure to apply ECA legislation to less privileged communities is behind many of the social problems that lead youths in these areas into crime in the first place. — Supporters of lowering the age of criminal responsibility argue that youths commit crimes because the punishment is too mild. In fact, one of the factors behind youth crime is lack of trust in the authorities. Many crimes are not investigated properly or followed up. And yes, these uninvestigated murders include killings of mainly black adolescents in poor communities – sometimes at the hands of the military police. — A string of high-profile homicides involving adolescents was seized upon by commentators, including journalist Rachel Sheherazade, to drum up support for the bill. But statistics show that in 2012 fewer than 1% of crimes were committed by adolescents between 16 and 18. Most crimes are committed by persons between the ages of 19 and 25. Not only that, adolescents are more likely to be victims of crime than perpetrators. The most recent annual survey, the Map of Violence, released on 13 May, showed that youths aged 15-19 were the victims of 59% of firearms homicides in 2012. The motive of retribution that underpins this bill has no place in a juvenile justice system. International law makes it clear that the age of majority is reached at 18 and that any person under that age who has committed a crime must be treated according to justice norms applicable to children and youths. This bill is about revenge, which runs counter to the aspiration for, and efforts towards, a more equal and just society. So does taking such a step back on children’s rights after making steady progress on tackling poverty over the past decade. Brazil’s adult prisons are already stretched to breaking point – with the fastest-growing prison population in the world. With no money to enlarge or improve them, it is difficult to see how they can handle more prisoners. Youths in some of the poorest communities themselves say they commit crimes because they have absolutely nothing to lose: no job prospects, abysmal living conditions and perhaps an insecure and dangerous living situation, under constant threat from gangs or fearing arbitrary ‘punishment’ from the military police who kill on average six people a day, according to the Brazil Forum on Public Safety in November 2014. They would be less likely to commit crimes if conditions improved in their communities, if they were not socially excluded and if they were able to complete their education and to look forward to rewarding employment. Ignoring, or worse still exacerbating, this reality is not only grossly unjust, it is certain to backfire (as the ‘war on drugs’ has, throughout Brazil). Given the right support and opportunities, many young offenders are able to turn their lives around for their own and the wider good of society, even when their start in life more or less propelled them towards a life of crime. What’s more, many of them want to. Statistics back up the argument for rehabilitation, showing youths are less likely to re-offend after undergoing this process. In Rio de Janeiro I have encountered many ex-young offenders now mentoring younger people to help them stay out of crime and drug trafficking. I am thinking in particular of one young woman from a favela in Rio de Janeiro who was smuggling drugs and weapons from Brazil to Paraguay for several years before being helped out of gangsterism through the Favela St football programme; she completed an apprenticeship, got a job and became a role model for younger girls in her community. She also managed to get her passport and will be soon be coming on a study trip to England. Doesn’t a case such as hers suggest that youthful potential deserves a second chance? Brazil is not the only country in Latin America to consider the option of lowering the age of criminal responsibility – Uruguayans rejected such a move last year. Yes, Brazil needs to tackle the issue of escalating crime urgently but criminalising children is not the solution. *Jo Griffin is a former Latin America correspondent and Guardian staff journalist. Her articles have appeared in the Guardian, Observer, Financial Times, BBC and elsewhere. She is writing a book about the teams for former street children who represented Brazil at the 2014 Street Child World Cup in Rio de Janeiro.